Avon Full Of Beans. Juggler The Seal And Stretch Giraffe New In Bags. Condition is Used. Made by Classic Collecticritters. 50th Anniversary of I Love Lucy. NSYNC Justin Timberlake Limited edition 2000 collectible Bear Justi n. Hard to find one of a kind collectible. Limited edition. 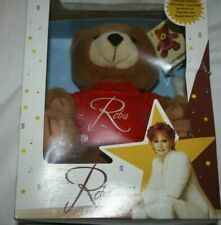 This Reba Bear is made by Signatures Superstar, by Designer Steven Smith from stuffed animals. This a limited edition Bear and and still in the box. Still would be nice for anyone that loves stuffed bears. Celebrity Bear Pink Beanie Bean Bag Plush "KATHERINE" gift NWT. Perfect gift for new arrival of baby. Materials: Polyester Fiber & P. E. Pellets. Color: Pink. This Bear is numbered 4797 of 35,000. Limited Edition Rare Bear. It's 6" tall X 4" wide. 2013 - 2018 Giant Panda Metro Toronto zoo 9"
JADITE GREEN. And. This bear is in Martha Stewart's favorite JADITE GREEN color! Martha Stewart's Jadite Green, Bouquet of Flowers and. MARTHA STEWART. Martha Stewart was always saying,“It's A Good Thing”, and. Display your sweet scented jumbo Pikmi inside the large lollipop or use it to display your collection of mini Pikmi plushies! Expand your collection with the Simone Biles Collector's Edition! This sweet scented jumbo sized Pikmi is so super soft and stretchy - you'll never want to let it go! 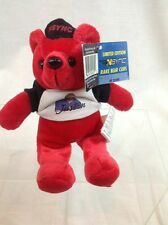 2001 Dale Earnhardt Jr Plush Bear. Get Images that. Make Supersized Seem Small. Trademarks remain the property of their respective holders. Embroidered on the bears tummy is a star shaped logo with WARS written atop the logo. Embroidered on the back of bear is words FAR FAR AWAY. and a directors chair. Style: Tom Glavine #47 NL Cy Young Beanbag Plush. Fabric: Polyester Fiber; PVC Pellets. Size: Length: 9". The 8 1/2" Celebrity Bear has a embroidered Beatle and drum set on the front and a British flag on the back. The product you see in the photos are the product you will receive. if you have any concerns about the condition, please ask and I will be happy to answer or send more photos of the item. .•Shipping •All items will be shipped within 1 business day of purchase. Business days are Monday - Friday. We ship in the smallest boxes possible to keep the freight to a minimum. •we do not ship internationally at this time. RICKY MARTIN and his famous hit song "LOCO FOR YOU". The bear is white with red and blue print. Young and old, alike, will go Loco for this bear! "Loco for You". RICKY MARTIN. Teddy Bear Bean Bag 9" Plush! If you're not happy, I'll make it right. This is Celebrity Bears #6 Bear. He is primarily blue with star embroidered belt. He is wearing a white bow around his neck. This bear is dated 5/18/1998 and is now a retired item. EXCELLENT condition for 17 years old! Teddy Bear Bean Bag 9" Plush. Celebrity Bears. Teddy Bear COLLECTOR, young or old! You will receive your TEDDY BEAR. Great gift for any CELEBRITY BEARS or. Celebrity Bear. Star Bear #67. worn it all. New in sealed plastic container. Nsync's collectible limited edition JC Chasez bear. This bear is numbered 02448 of 75,000. This listing is New with tag and tag protector Celebrity Bear Star #48 Daryl Hannah “ Splash” mermaid bear It comes from a smoke free home . I have other Rodman items for sale so please check them out. Thank you for looking! Ringo Starr. Ringo Starr of the Beatles!This brown bear features a drum kit. Teddy Bear Bean Bag 9" Plush! THE BEATLES. Great gift for any CELEBRITY BEARS or. Celebrity Bear., Who am I?. 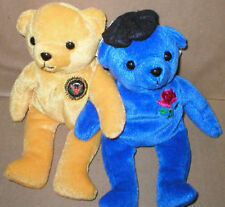 These bears have traveled in a yellow submarine and are from England. CELEBRITY BEARS 1998 Star #25 Mark McGuire 70 Home Runs! Bean Bag Plush MWMT! A baseball with the number 70 is embroidered on his back. Mark McGuire. Well made, quality bear is plump and full of beans. Teddy Bear Bean Bag 9" Plush! Great gift for any CELEBRITY BEARS or. Celebrity Bear. This plush toy is sporting a little Hello Kitty band-aid on her forehead! Cute little Hello Kitty will make a child happy. Teddy Bear Bean Bag 9" Plush! Teddy Bear COLLECTOR, young or old! You will receive your TEDDY BEAR. Great gift for any CELEBRITY BEARS or. Celebrity Bear. Star Bear #77. This green grouchy bear with big bushy black eyebrows sports a red Santa hat and pointed red booties. Limited Edition Ricky Martin Bean Bear'Livin' La Vida Loca' NIB (#1,182 of 25,000). Bear is NIB/Sealed- Box has chip on top right corner. Plastic wrap is cut on right side, but not detached. See pics for detail of condition. Otherwise In gently played with condition. ELVIS Collector Stamp Bear . ~Perfect for collecto rs & ELVIS Fans~. Soft plush light brown TEDDY BEAR. Stamp on lower front of jacket. THE King of Rock'n Roll. Wearing GOLD suit-GOLD Shoes-Gold Tie. Teddy Bear's cheek lights up in Red and starts to sing a Cupid song when paws are pressed. Press again to turn off. 100% POLYESTER FIBER FILLED.